Northeast Arkansas is within what is known as the New Madrid Seismic Zone (NMSZ). This is an area extending into Missouri, Illinois, Kentucky, Tennessee, and Mississippi that is prone to earthquakes. Many small earthquakes (both felt and not felt by people) happen across the area on a daily to weekly basis as recorded by the Center for Earthquake Research and Information (CERI) at the University of Memphis. In addition, large (magnitude 6-8) earthquakes have occurred many times in the NMSZ, and are currently estimated to occur about every 500 years (Tuttle, et al. 2005). (The most recent large quake was documented in 1811/1812 with an epicenter near New Madrid, MO and was estimated to be of a magnitude 7-8). Due to the wet, sandy nature of the sediments (gravels, sands and silts) in this area, during the large earthquakes, liquefaction and, following that, sand blows and subsidence often occur. This basically means that when wet sand gets shaken really hard, it becomes like a liquid and it can then flow up through cracks that have opened up because of the earthquake. The water then drains away and the sand is left on top, what we call a sand blow. These sand blows can be steep-sided, conical, sand-filled eruptive vents at the point of extrusion (where they come up to the surface) and are connected to the sand filled feeder dikes that allow the sand to come up from the stratum of well-sorted sand ~2 meters or less below the ground surface where the sand and water become fluid. Sometimes these sand blows form close together along a linear fissure and can combine to be hundreds of meters long (Saucier, 1989). Subsidence is when the ground surface falls due to the opening left by the sand being extruded during the sand blows (Lafferty et al., 1987). 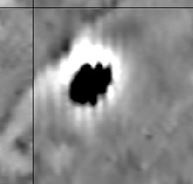 Gradiometry image of the burned structure (black) next to the earthquake crack (line running from SW to NE above structure). Recently, in studying the impact of these large earthquakes on Mississippian people in the AD1450’s, when one of these earthquakes has been dated (Tuttle, et al., 2011), we excavated a trench across an area that we expected to contain a burned structure and a sand filled earthquake crack - the evidence that the sand on the surface is from a sand blow and not something else such as flooding. Dr. Jami Lockhart had identified the area in the gradiometry data that he had run the previous spring, so we wanted to ground-truth it. The trench, made up of four 2mx2m excavation units, did indeed come down on both the earthquake crack and some of the remains of a burned structure. 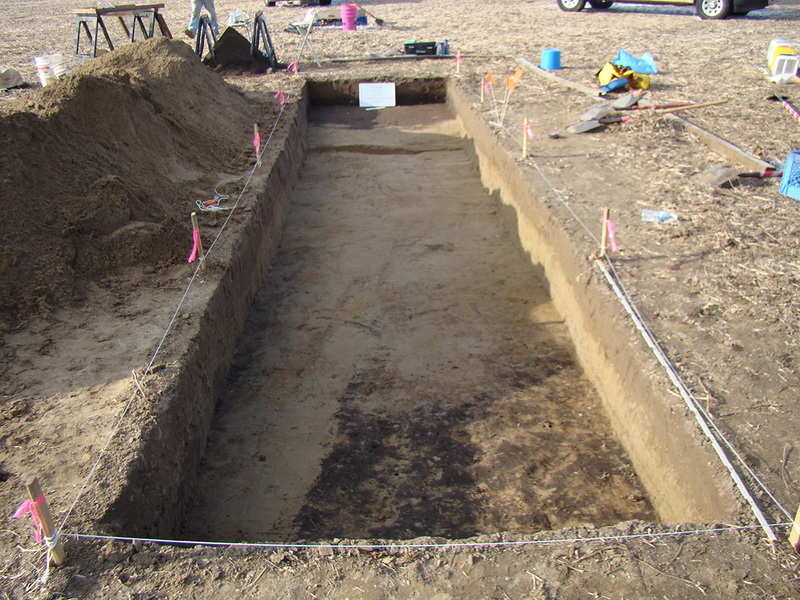 Even more interestingly, to the NW of the crack, the midden surface (dark soil representing the surface of the ground when the Native Americans lived there) was found in its original position, but to the SE, the ground surface had fallen at a 1.43˚ angle, making the midden surface immediately to the SE (@55cm below the surface) 10 cm lower than that further SE (@45cm below the surface). Now that we know that it was, in fact, the effect from an earthquake that covered this structure, we plan to go back in the near future to further excavate the structure to find out more about earthquake effects and the date of its occupation. 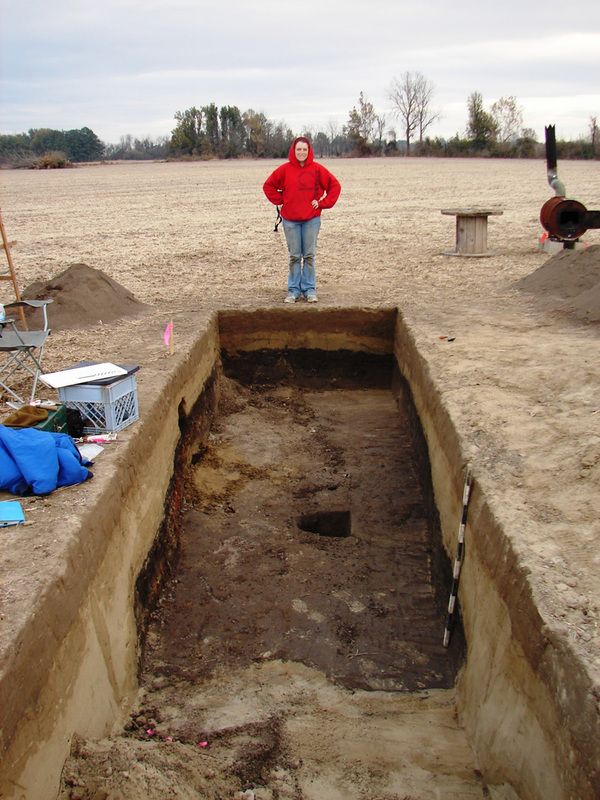 The author standing at the SE end of the trench. The sand filled earthquake crack is in the foreground and the midden layer gets closer to the current ground surface as it moves away from the crack, but there is still a layer of sand between the midden and the plow zone as shown in the photo below. 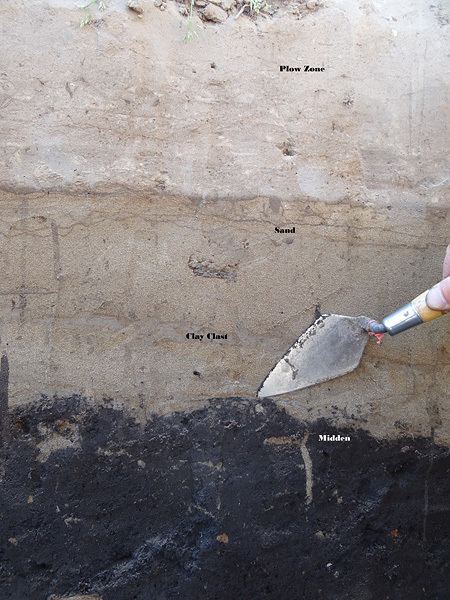 Close up with descriptions of the layers seen in the trench. The sand layer extends up into the plow zone as well, but it has been mixed with organic materials in the plow zone through years of agriculture. A clay clast is a bit of clay that was pulled out of place when the sand and water were fluid and then got stuck in the sand when the water receded. Looking NW. Midden is visible on the far NW end (in its original position) and is just being uncovered on the SE end, though it will take another 10cm of depth before it is uncovered near the earthquake crack. This difference in midden depth is because of subsidence of the ground surface as the sand moved from below the surface to above the surface. Lafferty III, Robert H, Margaret J Guccione, Linda J Scott, D Kate Aasen, Beverly J Watkins, Michael C Sierzchula, Paul F Baumann. 1987. A Cultural Resources Survey Testing, and Geomorphic Examination of Ditches 10, 12 and 29, Mississippi County, Arkansas. Report prepared for Memphis District, Corps of Engineers in accordance with Contract No. DACW66-86-C-0034. 1989. Evidence for episodic sand-blow activity during the 1811-1812 New Madrid (Missouri) earthquake series. Geology. Vol 17. 103-106. 2005. Evidence for New Madrid Earthquakes in A.D. 300 and 2350 B.C. Seismological Research Letters. Volume 76, Number 4. 489-501. Tuttle, Martitia P, Robert H Lafferty III, Robert F Cande, Michael C Sierzchula. 2011. Impact of earthquake-induced liquefaction and related ground failure on a Mississippian archeological site in the New Madrid seismic zone, central USA. Quaternary International. Vol 242. 126-137. Wolf, Lorraine W, Martitia P Tuttle, Sharon Browning, Stephanie Park. 2006. Geophysical surveys of earthquake-induced liquefaction deposits in the New Madrid seismic zone. Geophysics. Vol 71, No 6. B223-B230. 2015 Rathgaber, Michelle. Radiocarbon Dates from the Manley-Usrey Site (3MS106). Fieldnotes: Newsletter of the Arkansas Archeological Society. No 387. 2014 Rathgaber, Michelle. Preliminary Results of the 2012/2013 Manley-Usrey (3MS106) Excavations. Fieldnotes: Newsletter of the Arkansas Archeological Society. No 381.